North Korea has staged a huge parade to mark the 60th anniversary of the armistice that ended the Korean War. 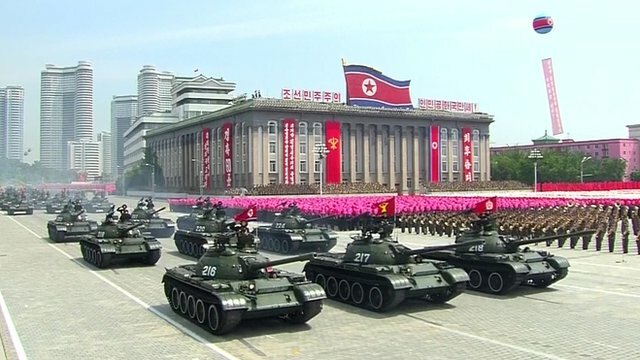 State TV showed soldiers and military hardware parading through the capital Pyongyang in a carefully choreographed display. Troops and spectators shouted their allegiance to North Korea's young ruler, Kim Jong-un. The 1950-53 Korean War ended in a truce although the North and South remain technically at war. Correspondents say the lavish parade of weapons and goose-stepping soldiers is reminiscent of marches held by the Soviet Union and China at the height of the Cold War. The TV pictures showed Kim Jong-un walking up to the podium on a red carpet with a military band playing in the background. He oversaw the parade flanked by military and ruling party leaders. Large banners hung from gas-filled balloons and the main square in Pyongyang was filled with North Korean flags. Over the past week North Korea has staged mass rallies and fireworks displays to commemorate the anniversary. It comes as North and South Korea try to restore ties following a period of high tension. Earlier this month, they ended a third round of talks on the re-opening of a jointly-run industrial zone without reaching a deal. Work at Kaesong has been suspended since mid-April when North Korea withdrew its workers. The move came amid tense relations between the two Koreas after Pyongyang's nuclear test in February. In South Korea, the anniversary was marked with a speech by President Park Geun-hye. She vowed not to tolerate provocations from North Korea but also said Seoul would work on building trust with the North. "I urge North Korea to give up the development of nuclear weapons if the country is to start on a path toward true change and progress," she said.